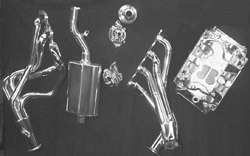 The header gases can radiate large amounts of heat in the engine area. For a cooler engine compartment, thermal ceramic coating provides the best solution. The coatings will not burn off or change color when applied properly and should last a life time. We always coat inside and double coat the outside of your system. Available in Cermachrome, Cast Iron, Black Satin, Satin Silver, Titanium, Raw Steel and White. Coatings available in above finishes. 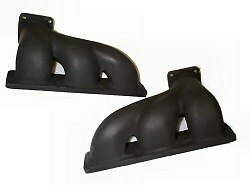 Our coatings eliminate rusting and lowers under hood temperatures. Our blue - green ceramic coating is formulated for early corvette restoration projects. It will not burn off. This color matches proper paint color on 6 cylinder engine blocks. 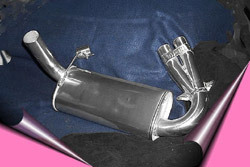 We can coat up to 6 foot in length and entire exhaust systems from head pipes to exhaust tips.